D3d9.dll issues are caused in one way or another by an issue with Microsoft DirectX. D3d9.dll not found. Reinstalling might help fix this. 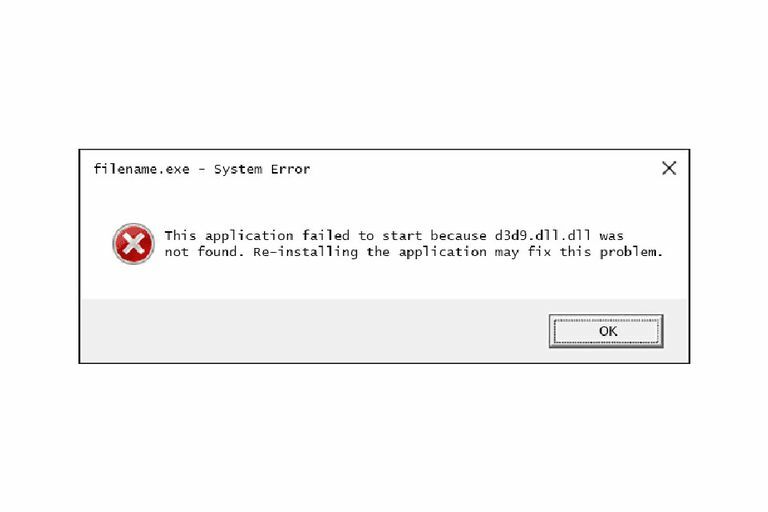 The d3d9.dll error message could apply to any program that utilizes Microsoft DirectX, most commonly video games, but it could also appear when another software program is started. Any of Microsoft's operating systems since Windows 98 may be affected by d3d9.dll and other DirectX issues. This includes Windows 10, Windows 8, Windows 7, Windows Vista, Windows XP, and Windows 2000. Do not download the d3d9.dll DLL file individually from any "DLL download site." There are a number of excellent reasons that downloading DLLs from these sites are never a good idea. If you've already downloaded d3d9.dll from one of those DLL download sites, remove it from wherever you put it and continue with these steps. Install the latest version of Microsoft DirectX. Chances are, upgrading to the latest version of DirectX will fix the d3d9.dll not found error. Assuming the latest DirectX version from Microsoft doesn't fix the d3d9.dll error you're receiving, look for a DirectX installation program on your game or application CD or DVD. Usually, if a game or other program utilizes DirectX, the software developers will include a copy of DirectX on the installation disc. Uninstall the game or software program and then reinstall it again. Something might have happened to the program files that work with d3d9.dll and a reinstall could do the trick. You might try removing the program with a free software uninstaller tool to make sure that all of the installation files and registry data is removed. Using the standard uninstall method might not delete everything that needs to be deleted, which could cause other problems during the reinstall. Restore the d3d9.dll file from the latest DirectX software package. If the above troubleshooting steps haven't worked to solve your d3d9.dll error, try extracting the d3d9.dll individually from the DirectX downloadable package. Where you put the extracted d3d9.dll file depends on the application that needs it. If the DLL error tells you the specific folder where d3d9.dll is missing from, copy the d3d9.dll file to that location. However, since most programs probably look for d3d9.dll in C:\Windows\system32\, copy the DLL file there if you're not explicitly told where to put it. Some DirectX installations might use C:\Windows\SysWOW64\ instead.